FUOYE Students Protest “No School Fees, No Examination”. On Monday, 14th May, 2018. 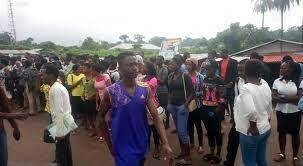 Students of the Federal University Oye-Ekiti (FUOYE) engaged in a peaceful protest the “no School Fees, No Examination” policy. The institution’s directive had already posted a notice preventing students who had not paid their school fees from sitting for the ongoing first semester examination. According to the institution’s Public Relations Officer, Mr Godfrey Badji, some students who had not fully paid their school fees were the ones protesting. The student expressed their grievances as some were denied access to the exam hall even though the school fees deadline had not elapsed.